Finally, Fujifilm has announced its another exquisite camera named as Fujifilm X-T100 in Australia just now. This is a midrange SLR-styled mirror-less camera based on an entry-level X-A5. The X-T100 is fully pronouncing touchscreen as well as borrows a great-sized OLED EVF from Fujifilm X-T20. The X-T100 comes with a 24MP CMOS sensor, a hybrid autofocus system along with 91 phase-detect points. Furthermore, Fujifilm X-T100 is well-liked Film Simulation modes and 4K/15p video capture. The camera is capable enough to shoot around 6 frames per second and capture 4K UHD videos. The battery is pretty impressive and lets you shoot almost 430 photos in a single charge. The Fujifilm will be available with or without Fujinon CX 15-45mm F3.5-5.6 OIS PZ lens and price will vary accordingly. 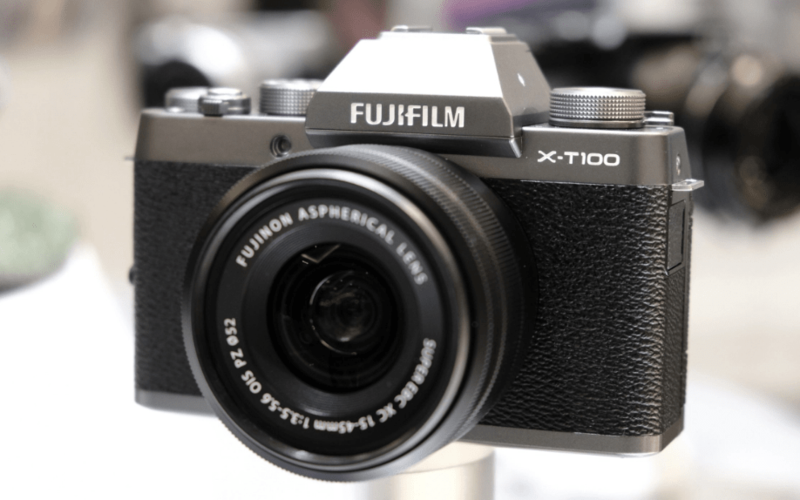 To get to know more, we come up with Fujifilm X-T100 review including its release date, price, and specifications. So, let’s begin. The Fujifilm X-T100 release date in Australia is May 24, 2018. The camera is slated to ship in June, however. The Fujifilm X-T100 will be available body only or as a part of a kit along with Fujifilm CX 15-45mm f/3.5-5.6 OIS PZ lens. The Fujifilm X-T100 Price in Australia will start from AU$790 for its body only, whereas the kit will be available for AU$920 respectively. We don’t have exact Australian pricing or availability this time around, but those prices are directly converted based on UK prices. We will let you know further, as soon as we hear more. So, check back soon. Here is a quick rundown of Fujifilm X-T100 Specifications and features. Have a look! 1: There is super-speed imaging processor loaded with Phase Detection AF system and 24.2MP APS-C CMOS sensor. 2: A 3-inches HD LCD touchscreen can be tiled in 3 ways. 4: It lets you record 4K UHD videos almost 30 minutes. Full high-definition 1920 x 108059.94p/50p/24p/23.98p – continuous recording for 30 minutes. HD 1280 x 720 59.94p/50p/24p/23.98p – continuous recording around 30 minutes. High-Speed Movie 1280 x 720/1.6x/2x/3.3x/4x – continuous recording almost 7 minutes. 7: Instax SHARE app lets you send images for printing with ease. The Fujifilm is sleek and stylish new addition of Fujifilm’s X-series well-equipped with 24.2 MP sensor, three-way tilting touchscreen, latest Bluetooth 1 technology, and Fujifilm’s own signature colour reproductions technology. Talking about its little design, Fujifilm X-T100 is offering a high-magnification electronic viewfinder, an extended battery life of up to 430 frames and a horizontal tilting rear LCD screen. 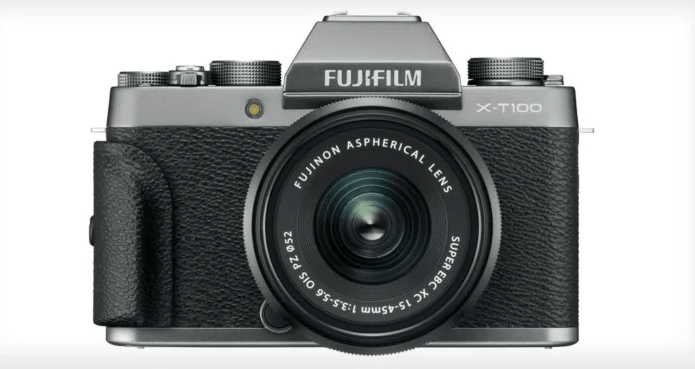 The X-T100 weighs 448 grams and comprises an anodised-coated aluminum top cover which gives it a retro look with a premium feel. The X-T100 uses the latest built-in Bluetooth technology and a super 24.2MP APS-C size sensor which is almost 14 times largest as compared to those sensors inside conventional smartphones – making image transfer quick and easy for sharing with your near and dear. A new Autofocus Algorithm and a Phase Detection Autofocus system is also available offering perfect and fast focus and superb image quality and iconic colour reproduction technology (Fujifilm’s own). The X-T100 will be available in three sensational colours – Dark Silver, Champagne Gold and Black. 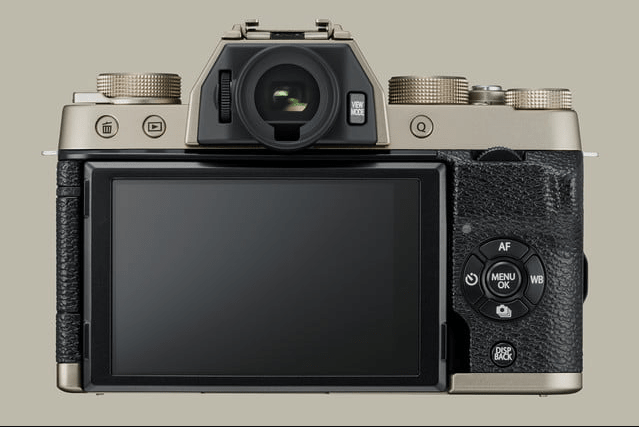 There are three control dials on the top cover as Fujifilm is following a familiar design of Fujifilm’s popular X-T series. The Fujifilm x-T100 boasts a Phase Detection pixels and a recently developed algorithm which is specifically manufactured for the flagship X Series models. As mentioned above, the Intelligent Hybrid AF system lets you capture gorgeous photographic moments instantly with a fast and precise autofocus. Also, the evolved SR+ Auto Mode combines subject and scene gratitude. These automatic functions are making a stand of out from the crowd. The camera is approachable and easy to use for all levels of enthusiasts. The X-T100 comes with a new Bluetooth technology which lets you transfer images and videos to your smartphones and tablet devices without any hassle. The all-in-one transfer function offers relentless image transfer even in shooting mode, enabling images to be shared and uploaded at a moment’s notice. Most interestingly, Fujifilm X-T100 is compatible with FUJIFILM Instax SP-3 printer so that you can enjoy the fun of sharing and printing their images. You can adjust its setting quickly and easily with one-step operation possible thanks to exposure compensation dial, touch-and-flick function and of course the functional dial.